In late 1202, financial issues led to the Crusader army sacking Zara, which was then brought under Venetian control. In January 1203, en-route to Jerusalem, the Crusader leadership entered into an agreement with the Byzantine prince Alexios Angelos to divert the Crusade to Constantinople and restore his deposed father as Emperor. The intent of the Crusaders was then to continue to Jerusalem with promised Byzantine financial and military aid. On 23 June 1203, the bulk of the Crusaders reached Constantinople, while smaller contingents continued to Acre. After the siege of Zara the pope excommunicated the crusader army. In August, following clashes outside Constantinople, Alexios was crowned co-Emperor. However, in January 1204, he was deposed by a popular uprising. The Crusaders were no longer able to receive their promised payments from Alexios. Following the murder of Alexios on 8 February, the Crusaders decided on the outright conquest of the city. In April 1204, they captured and plundered the city's enormous wealth. Only a handful of the Crusaders continued to the Holy Land thereafter. The conquest of Constantinople was followed by the fragmentation of the Empire into three rump states centred in Nicaea, Trebizond and Epirus. The Crusaders then founded several Crusader states in former Byzantine territory, largely hinged upon the Latin Empire of Constantinople. The presence of the Latin Crusader states almost immediately led to war with the Byzantine successor states and the Bulgarian Empire. 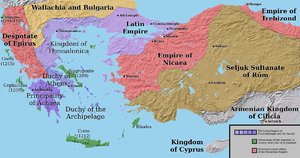 The Nicaean Empire eventually recovered Constantinople and restored the Byzantine Empire in 1261. The Crusade is considered to be one of the most prominent acts that solidified the schism between the Greek and Latin Christian churches, and dealt an irrevocable blow to the already weakened Byzantine Empire, paving the way for Muslim conquests in Anatolia and Balkan Europe in the coming centuries. Ayyubid Sultan Saladin had conquered most of the Frankish, Latin Kingdom of Jerusalem, including the ancient city itself, in 1187. The Kingdom had been established 88 years before, after the capture and sack of Jerusalem in the First Crusade, which had been a Byzantine holding prior to the Muslim conquests of the 7th century. The city was sacred to Christians, Muslims and Jews, and returning it to Christian hands had been a primary purpose of the First Crusade. Saladin led a Muslim dynasty, and his incorporation of Jerusalem into his domains shocked and dismayed the Catholic countries of Western Europe. Legend has it that Pope Urban III literally died of the shock, but the timing of his death makes that impossible. The crusader states had been reduced to three cities along the sea coast: Tyre, Tripoli, and Antioch. Constantinople had been in existence for 874 years at the time of the Fourth Crusade and was the largest and most sophisticated city in Christendom. Almost alone amongst major medieval urban centres, it had retained the civic structures, public baths, forums, monuments, and aqueducts of classical Rome in working form. At its height, the city held an estimated population of about half a million people behind thirteen miles of triple walls. Its planned location made Constantinople not only the capital of the surviving eastern part of the Roman Empire but also a commercial centre that dominated trade routes from the Mediterranean to the Black Sea, China, India and Persia. As a result, it was both a rival and a tempting target for the aggressive new states of the west, notably the Republic of Venice. One of the leaders of the Third Crusade, Holy Roman Emperor Frederick I Barbarossa, openly plotted with the Serbs, Bulgarians, Byzantine traitors, and even the Muslim Seljuks against the Eastern Empire and at one point sought Papal support for a crusade against the Orthodox Byzantines. Crusaders also seized the breakaway Byzantine province of Cyprus; rather than return it to the Empire, Richard I of England sold the island to the Knights Templar. Barbarossa died on crusade, and his army quickly disintegrated, leaving the English and French, who had come by sea, to fight Saladin. In 1195 Henry VI, son and heir of Barbarossa, sought to efface this humiliation by declaring a new crusade, and in the summer of 1197 a large number of German knights and nobles, headed by two archbishops, nine bishops, and five dukes, sailed for Palestine. There they captured Sidon and Beirut, but at the news of Henry's death in Messina along the way, many of the nobles and clerics returned to Europe. Deserted by much of their leadership, the rank and file crusaders panicked before an Egyptian army and fled to their ships in Tyre. 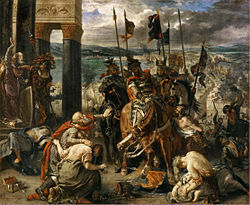 Boniface and the other leaders sent envoys to Venice, Genoa, and other city-states in 1200 to negotiate a contract for transport to Egypt, the stated objective of their crusade; one of the envoys was the future historian Geoffrey of Villehardouin. Earlier crusades focused on Palestine had involved the slow movement of large and disorganised land hosts across a generally hostile Anatolia. Egypt was now the dominant Muslim power in the eastern Mediterranean but also a major trading partner of Venice. An attack on Egypt would clearly be a maritime enterprise, requiring the creation of a fleet. Genoa was uninterested, but in March 1201 negotiations were opened with Venice, which agreed to transport 33,500 crusaders, a very ambitious number. This agreement required a full year of preparation on the part of the Venetians to build numerous ships and train the sailors who would man them, all the while curtailing the city's commercial activities. The crusading army was expected to consist of 4,500 knights (as well as 4,500 horses), 9,000 squires, and 20,000 foot-soldiers. There was no binding agreement among the crusaders that all should sail from Venice. Accordingly, many chose to sail from other ports, particularly Flanders, Marseille, and Genoa. By May 1202, the bulk of the crusader army was collected at Venice, although with far smaller numbers than expected: about 12,000 (4–5,000 knights and 8,000 foot soldiers) instead of 33,500. The Venetians had performed their part of the agreement: there awaited 50 war galleys and 450 transports – enough for three times the assembled army. The Venetians, under their aged and blind Doge Dandolo, would not let the crusaders leave without paying the full amount agreed to, originally 85,000 silver marks. The crusaders could only initially pay 35,000 silver marks. The Doge threatened to keep them interned unless full payment was made so a further 14,000 marks was collected, and that only by reducing the crusaders to extreme poverty. This was disastrous to the Venetians, who had halted their commerce for a great length of time to prepare this expedition. In addition, about 14,000 men or as many as 20–30,000 men (out of Venice's population of 60–100,000 people) were needed to man the entire fleet, placing further strain on the Venetian economy. King Emeric was Catholic and had himself taken the cross in 1195 or 1196. Many of the crusaders were opposed to attacking Zara, and some, including a force led by the elder Simon de Montfort, refused to participate altogether and returned home. While the Papal legate to the Crusade, Cardinal Peter of Capua, endorsed the move as necessary to prevent the crusade's complete failure, the Pope was alarmed at this development and wrote a letter to the crusading leadership threatening excommunication. When Innocent III heard of the sack, he sent a letter to the crusaders excommunicating them and ordering them to return to their holy vows and head for Jerusalem. Out of fear that this would dissolve the army, the leaders of the crusade decided not to inform their followers of this. Regarding the Crusaders as having been coerced by the Venetians, in February 1203 he rescinded the excommunications against all non-Venetians in the expedition. To take the city by force, the crusaders first needed to cross the Bosphorus. About 200 ships, horse transports, and galleys delivered the crusading army across the narrow strait, where Alexios III had lined up the Byzantine army in battle formation along the shore, north of the suburb of Galata. The Crusader knights charged straight out of the horse transports, and the Byzantine army fled south. The Crusaders followed and attacked the Tower of Galata, which held the northern end of the massive chain that blocked access to the Golden Horn. The Tower of Galata held a garrison of mercenary troops of English, Danish, and Italian origin. As the crusaders laid siege to the Tower, the defenders routinely attempted to sally out with some limited success, but often suffered bloody losses. On one occasion the defenders sallied out but were unable to retreat back to the safety of the tower in time, the Crusader forces viciously counterattacked, with most of the defenders being cut down or drowning in the Bosporus in their attempts to escape. The tower was swiftly taken as a result. The Golden Horn now lay open to the Crusaders, and the Venetian fleet entered. The Crusaders sailed alongside Constantinople with 10 galleys to display the would-be Alexios IV, but from the walls of the city citizens taunted the puzzled crusaders, who had been led to believe that they would rise up to welcome the young pretender Alexios as a liberator. Alexios IV realised that his promises were hard to keep. Alexios III had managed to flee with 1,000 pounds of gold and some priceless jewels, leaving the imperial treasury short on funds. At that point the young emperor ordered the destruction and melting of valuable Byzantine and Roman icons in order to extract their gold and silver, but even then he could only raise 100,000 silver marks. In the eyes of all Greeks who knew of this decision, it was a shocking sign of desperation and weak leadership, which deserved to be punished by God. The Byzantine historian Nicetas Choniates characterized it as "the turning point towards the decline of the Roman state". According to a subsequent treaty, the empire was apportioned between Venice and the leaders of the crusade, and the Latin Empire of Constantinople was established. Boniface was not elected as the new emperor, although the citizens seemed to consider him as such; the Venetians thought he had too many connections with the former empire because of his brother, Renier of Montferrat, who had been married to Maria Komnene, empress in the 1170s and 1180s. Instead they placed Baldwin of Flanders on the throne. Boniface went on to found the Kingdom of Thessalonica, a vassal state of the new Latin Empire. The Venetians also founded the Duchy of the Archipelago in the Aegean Sea. Meanwhile, Byzantine refugees founded their own rump states, the most notable of these being the Empire of Nicaea under Theodore Laskaris (a relative of Alexios III), the Empire of Trebizond, and the Despotate of Epirus. The Latin Empire was soon faced with a number of enemies. Besides the individual Byzantine rump states in Epirus and Nicaea, and the also Christian Bulgarian Empire, there was also the Seljuk Sultanate. The Greek states fought for supremacy against both the Latins and each other, . The prominent medievalist Steven Runciman wrote in 1954: "There was never a greater crime against humanity than the Fourth Crusade." The controversy that has surrounded the Fourth Crusade has led to diverging opinions in academia on whether its objective was indeed the capture of Constantinople. The traditional position, which holds that this was the case, was challenged by Donald E. Queller and Thomas F. Madden in their book The Fourth Crusade (1977). Eight hundred years later, Pope John Paul II twice expressed sorrow for the events of the Fourth Crusade. In 2001, he wrote to Christodoulos, Archbishop of Athens, "It is tragic that the assailants, who set out to secure free access for Christians to the Holy Land, turned against their brothers in the faith. The fact that they were Latin Christians fills Catholics with deep regret." In 2004, while Bartholomew I, Patriarch of Constantinople, was visiting the Vatican, John Paul II asked, "How can we not share, at a distance of eight centuries, the pain and disgust." This has been regarded as an apology to the Greek Orthodox Church for the massacres perpetrated by the warriors of the Fourth Crusade. Neal Stephenson's and Nicole Galland's novel The Rise and Fall of D.O.D.O deals with events leading up to and during the Sack of Constantinople from the perspective of modern time travellers. The IVth Crusade is the title of British death metal band Bolt Thrower's fourth studio album released in 1992. Bitter Crusade is a Chronicle, written by Zach Bush, James Maliszewski and Joshua Mosqueira Asheim, for White Wolf's Vampire: The Dark Ages, in which characters get involved in the events of the 4th Crusade. ^ Mayer, Hans Eberhard. The Crusades. p. 136. ISBN 0-19-873097-7. ^ Haldon, John (2002). Byzantium at War. Oxford: Osprey. p. 87. ^ Phillips, Jonathan (2004). The Fourth Crusade and the Sack of Constantinople. New York: Viking. p. 14. ISBN 978-0-14-303590-9. ^ Nicolle, David (2011). The Fourth Crusade 1202–04 – the Betrayal of Byzantium. Oxford: Osprey Publishing Ltd. p. 15. ISBN 978 1 84908 319 5. ^ Nicolle, David. The Fourth Crusade 1202-04. p. 15. ISBN 978-1-84908-319-5. ^ Sherrard, Philip (1967). Byzantium. Nederland: Time-Life Books. pp. 42–43. ^ Madden, Thomas F. (August 19, 2008). The Fourth Crusade: Event, Aftermath, and Perceptions: Papers from the Sixth Conference of the Society for the Study of the Crusades and the Latin East in Istanbul, Turkey. ISBN 0-7546-6319-1. ^ Runciman, Steven (1954). A History of the Crusades: The Kingdom of Acre and the Later Crusades (Volume 3). ISBN 0-14-013705-X. ^ Setton, Kenneth Meyer (1976). The Papacy and the Levant, 1204–1571: The thirteenth and fourteenth centuries. American Philosophical Society. p. 7. ISBN 9780871691149. ^ Runciman, Steven (1954). A History of the Crusades: The Kingdom of Acre and the Later Crusades (Volume 3). Cambridge: Cambridge University Press. p. 111. ISBN 978-0-521-34772-3. ^ Philips Hughes, "Innocent III & the Latin East," History of the Church, Sheed & Ward, 1948, vol. 2, p. 370. ^ Robert de Clari, La Prise de Constantinople, xi–xii, in Hopf, Chroniques Greco-Romaines, pp. 7–9. Old French. ^ Phillips. The Fourth Crusade, p. 57. ^ Zara is the today the city of Zadar in Croatia; it was called "Jadera" in Latin documents and "Jadres" by French crusaders. The Venetian (Italian) "Zara" is a later derivation of the contemporary vernacular "Zadra". ^ Person Page 10465. thePeerage.com. ^ Madden, Thomas F., and Donald E. Queller. The Fourth Crusade: The Conquest of Constantinople. Philadelphia, PA: University of Pennsylvania Press, 1997. ^ Emeric (king of Hungary). Britannica Online Encyclopedia. ^ Phillips, The Fourth Crusade, pp. 110–11. ^ Philip Hughes, "Innocent III & the Latin East," History of the Church, vol. 2, p. 371, Sheed & Ward, 1948. ^ Hindley, Geoffrey (2003). The Crusades: A History of Armed Pilgrimage and Holy War. New York: Carroll & Graf Publishers. pp. 143, 152. ^ Runciman, Stephen (1975). A History of the Crusades – the Kingdom of Arce and the Later Crusades. Cambridge: Cambridge University Press. p. 115. ISBN 0 521 20554 9. ^ Richard, Jean. The Crusades c. 1071 – c. 1291. p. 247. ISBN 0-521-62566-1. ^ Phillips, Jonathan (2004). 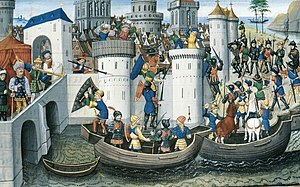 The Fourth Crusade and the Sack of Constantinople. New York: Viking. p. 269. ISBN 978-0-14-303590-9. ^ Phillips. The Fourth Crusade, p. 113. ^ a b Nicolle, David (2011). The Fourth Crusade 1202–04 – the Betrayal of Byzantium. Oxford: Osprey Publishing Ltd. p. 41. ISBN 978 1 84908 319 5. ^ Phillips. The Fourth Crusade, p. 159. ^ Phillips. The Fourth Crusade, p. 162. ^ Andrea, Alfred. Contemporary Sources For The Fourth Crusade. pp. 191–192. ^ Andrea, Alfred. Contemporary Sources For The Fourth Crusade. p. 193. ^ Phillips. The Fourth Crusade, p. 164. ^ Phillips. The Fourth Crusade, p. 176. ^ Phillips. The Fourth Crusade, p. 177. ^ a b Phillips. The Fourth Crusade, p. 209. ^ Nicolle, David (2011). The Fourth Crusade 1202–04 – the Betrayal of Byzantium. Oxford: Osprey Publishing Ltd. pp. 25, 65. ISBN 978 1 84908 319 5. ^ Nicolle, David (2011). The Fourth Crusade 1202–04 – the Betrayal of Byzantium. Oxford: Osprey Publishing Ltd. p. 77. ISBN 978 1 84908 319 5. ^ a b Vryonis, Speros (1967). Byzantium and Europe. New York: Harcourt, Brace & World. p. 152. ^ a b Hughes, Philip. "Innocent III & the Latin East," History of the Church, Sheed & Ward, 1948, vol. 2, p. 372. ^ Nicolle, David (2011). The Fourth Crusade 1202–04 – the Betrayal of Byzantium. Oxford: Osprey Publishing Ltd. p. 78. ISBN 978 1 84908 319 5. ^ Pope Innocent III, Letters, 126 (given July 12, 1205, and addressed to the papal legate, who had absolved the crusaders from their pilgrimage vows). Text taken from the Internet Medieval Sourcebook by Paul Halsall. Modified. Original translation by J. Brundage. ^ Richard, Jean. The Crusades c. 1071 – c. 1291. pp. 252–57. ISBN 0 521 62369 3. ^ Thurbon, Colin (1981). The Venetians. Amsterdam: Time-Life Books Inc. pp. 25, 65. ISBN 0-7054-0633-4. ^ D'Amato, Raffaele (2007). The Eastern Romans 330–1461 AD. Hong Kong: Concord Publications. p. 42. ISBN 962-361-089-0. ^ Choniates, Niketas; Magoulias, Harry J. (trans.) (1984). O City of Byzantium: Annals of Niketas Choniatēs. Wayne State University Press. p. 317. ISBN 978-0-8143-1764-8. ^ Runciman. History of the Crusades. 3. p. 130. ^ Sherrard, Philip (1967). Byzantium. Nederland: Time-Life Books. pp. 166–67. ^ Pope John Paul II (2001). "In the Footsteps of St. Paul: Papal Visit to Greece, Syria & Malta – Words". EWTN. ^ "Pope sorrow over Constantinople". BBC News. June 29, 2004. ^ Phillips. The Fourth Crusade. p. xiii. ^ Ecumenical Patriarch Bartholomew I (April 2004). "News". In Communion. Archived from the original on 2007-10-09. ^ Asheim,, Joshua. Bitter Crusade (1st ed.). White Wolf Publishing, Inc. p. 112. ISBN 1-58846-214-5. "The Sack of Constantinople by the Crusaders". shsu.edu. 1204. Archived from the original on 2007-09-27. "The Medieval Russian Account of the Fourth Crusade – A New Annotated Translation". academia.edu. Queller, Donald E., and Susan J. Stratton. "A Century of Controversy on the Fourth Crusade", in Studies in Medieval and Renaissance History v. 6 (1969): 237–77; reprinted in Donald E. Queller, Medieval Diplomacy and the Fourth Crusade. London: Variorum Reprints, 1980. Kazhdan, Alexander "Latins and Franks in Byzantium", in Angeliki E. Laiou and Roy Parviz Mottahedeh (eds. ), The Crusades from the Perspective of Byzantium and the Muslim World. Washington, D.C.: Dumbarton Oaks, 2001: 83–100. Kolbaba, Tia M. "Byzantine Perceptions of Latin Religious ‘Errors’: Themes and Changes from 850 to 1350", in Angeliki E. Laiou and Roy Parviz Mottahedeh (eds. ), The Crusades from the Perspective of Byzantium and the Muslim World Washington, D.C.: Dumbarton Oaks, 2001: 117–43. Wikimedia Commons has media related to Fourth Crusade.